Pedro Pena didn't last long in this July 1989 contest for Southern Oregon, according to The Eugene Register-Guard. He gave up a run without giving up a hit in the first inning. They did it again in the third before Pena gave up a third run on a single, The Register-Guard wrote. Those three innings were as far as Pena got in the game. His career ended up being brief as well. He he played in three professional seasons, never making AA. 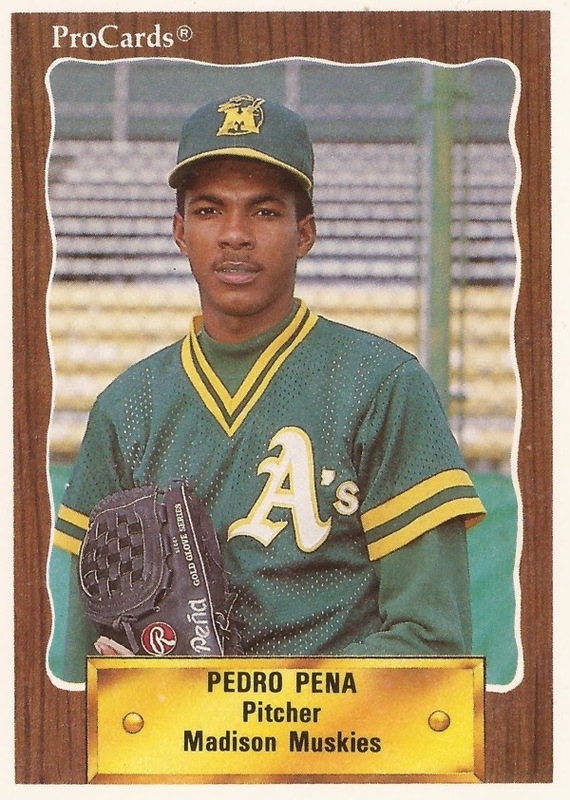 Pena's career began in 1989, signed the previous year by the Athletics as a free agent out of his native Dominican Republic. Pena played his first season between Southern Oregon and single-A Modesto. He got 15 outings, 11 starts at Southern Oregon, going 5-2, with a 2.69 ERA. He got three outings at Modesto. For 1990, Pena moved to single-A Madison. He also returned to Modesto. Between them, he got 26 starts and had a record of 8-11. He had a 3.17 ERA. Pena was then involved in a trade. He was sent as the player-to-be-named with Darren Lewis to the Giants in exchange for Ernie Riles. Pena found himself assigned to high-A San Jose, back in the California League. He got 16 outings there, 14 starts. He went 4-4, with a 3.26 ERA. It was his final season as a pro.